For Christmas, you drive down to a friend's house in the south. Homemade meat loaf, fried chicken with cream gravy, classic macaroni and cheese, Southern style cornbread, crockpot barbecue country style ribs. You think to yourself, "Wow, these southern ladies really know how to cook." Just when you've stuffed yourself up to bursting, they serve the dessert: chocolate pecan pie. You can't resist the lure of this chocolate pecan pie. You take just a little teeny-weeny bite. Oh the glorious taste. The sweet sumptuous chocolate taste combines incredibly well with the buttery and rich pecan tang. This is certainly a great twist to the traditional pecan pie you've been eating. Every bite of the chocolate pecan pie makes you want to taste even more. You feel happy, slightly intoxicated, and so at peace with the world that you want to hug everyone in sight. Maybe you're letting yourself get carried away. But you feel like you've been taken back to the times when the Mayan people drank a warm unsweetened liquid chocolate for life and fertility. Chocolate was so precious then to the Mayans and the Aztecs who conquered them that it was used for currency. In the old Spanish courts where chocolate was brought after Cortes' journey to the Americas, it was mixed with sugar, vanilla, nutmeg, cloves, allspice, and cinnamon to produce an enticing drink. You picture yourself in the French courts in the 1600s where chocolate was reputed to be an aphrodisiac. Even the famous Casanova was rumored to use chocolates laced with champagne to seduce ladies. You indulge in the bittersweet buttery flavor from the pecans in the chocolate pecan pie. These pecans also have a great story to tell. Some Native American tribes considered the pecan tree a symbol of the Great Spirit, the creator of all things. You picture yourself in the pre-colonial North America worshipping the Great Spirit under the wide canopy of the pecan tree. The nuts were favored by the Native Americans for food during the lean months of winter. You imagine the creamy liquid powcohicora prepared from pecan nuts drunk for sustenance or being added to broths or meat stews. Pecan fruits or nuts were considered valuable, so much so that they were used by the Native Americans as currency to trade for hides and mats from the Spaniards. Did anyone back then every think that they could make something as sinfully delicious as chocolate pecan pie from chocolates and pecans? You rouse yourself from your reveries to find your slice of chocolate pecan pie gone. You reach for another slice, just a small one and go back to your reveries. The great pecan pie had its roots in New Orleans. When the French settled in this area, the Native Americans taught them about pecans. Several nutty experiments later, voila! The pecan pie. You can't believe the first recipe for the pecan pie was made in 1925. 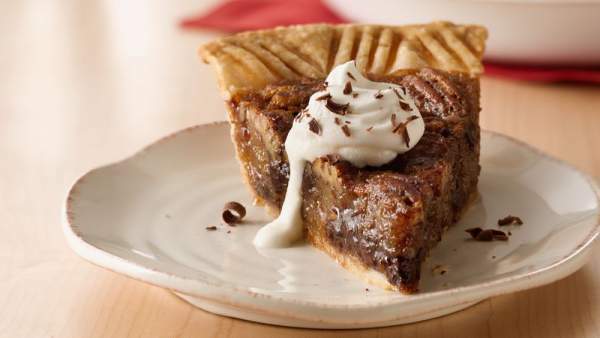 It must have taken years to perfect the recipe for the perfect combination found in chocolate pecan pie. At least, that explains how the chocolate pecan pie became one of the most loved ingredients of a traditional Southern cooked meal. For the best that Southern cooking has to offer, go to Tanner's Pecans and Candies. They offer a homemade chocolate pecan pie and other pecan treats for desserts that complete every home cooked meal.